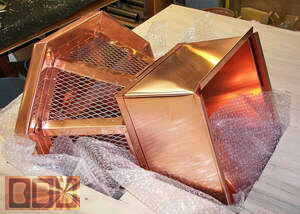 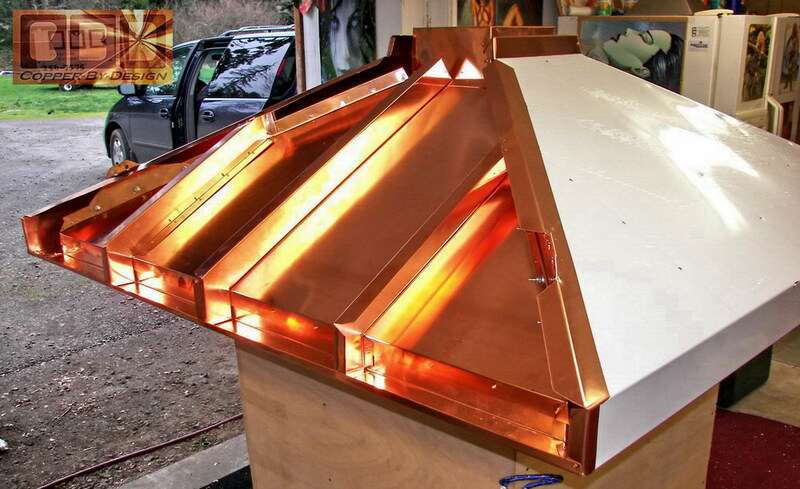 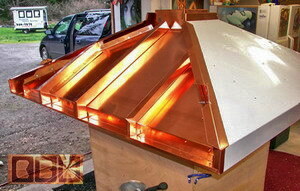 This fireplace hood was a collaborative design with our client named Harry Takhar in Bemidji, Minnesota. 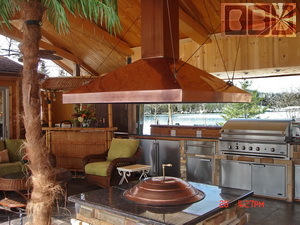 It was made to be mounted over an outdoor fireplace that is under a breezeway roof between a pair of enclosed gazebos. 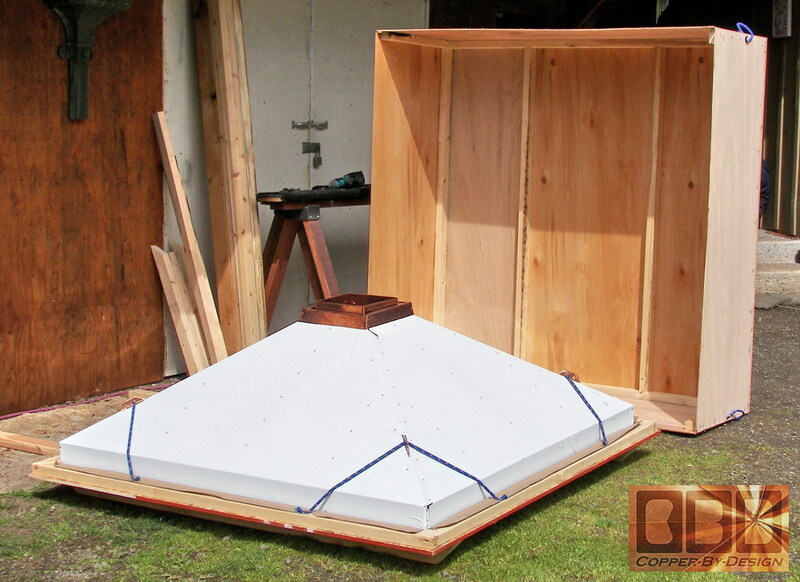 It has a 7.5/12 pitch hipped double layer hood design. 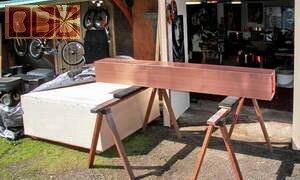 The liner shown here is 4' 9" wide square, but the outer shell is to be 5' 2.5" wide. 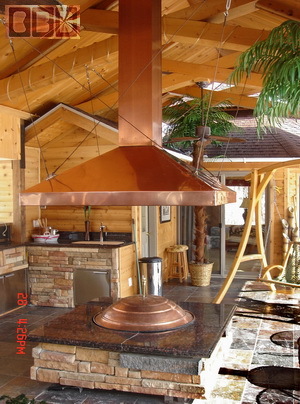 He originally asked us about making this with a curved slope upwards, like his kitchen range hood, which he had paid $11k that was made in Denmark. 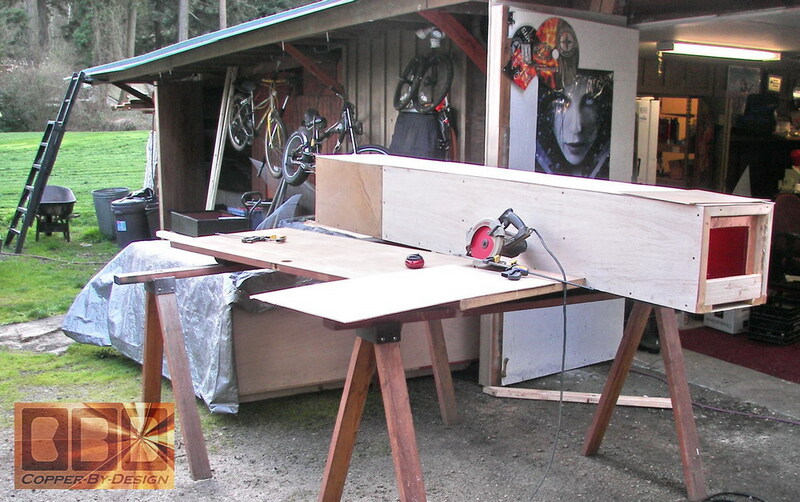 I cautioned him about the cost of doing curves, and reminded him that to make something twice as large would probably cost him $22k. And how he would be better off having that other company in Denmark build it, since our focus is more on strength and functionality than seamless good looking close-up details. 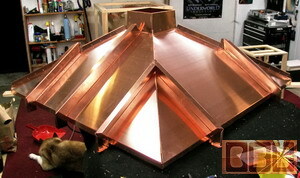 This fireplace hood will be subjected to far greater heat than his kitchen hood, so we could not just solder it together. 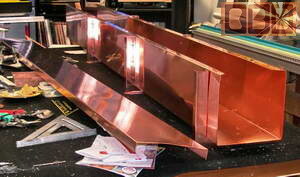 Instead we use rivets through overlapping seams and through the internal bracing. 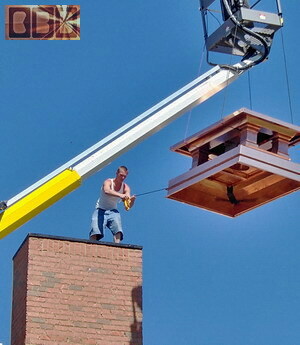 After careful evaluation of his needs and resources; he decided we were the best company for this project. The outer shell is spaced 2.5" apart from the underside liner with this internal bracing you see mounted on the liner, and later attached to the outer shell. The photo below right shows the thick 48oz copper bracket to suspend this hood with the 100' spool of 4 gauge copper wire we sent with it. 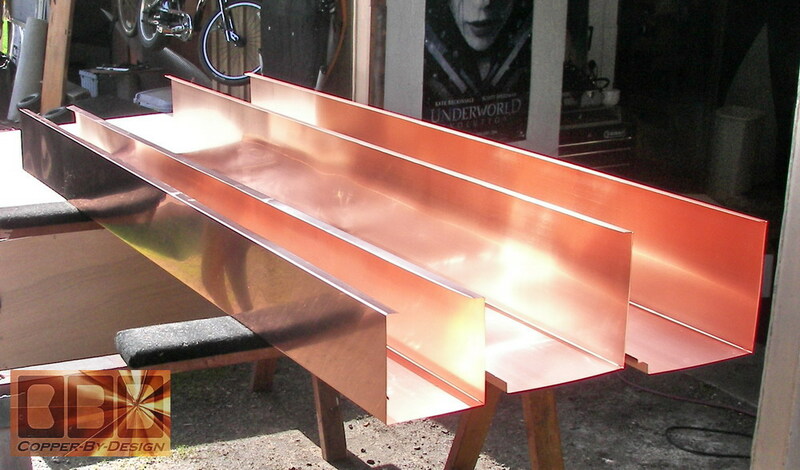 We are also including the stainless steel eye-hooks to mount into the beams above. 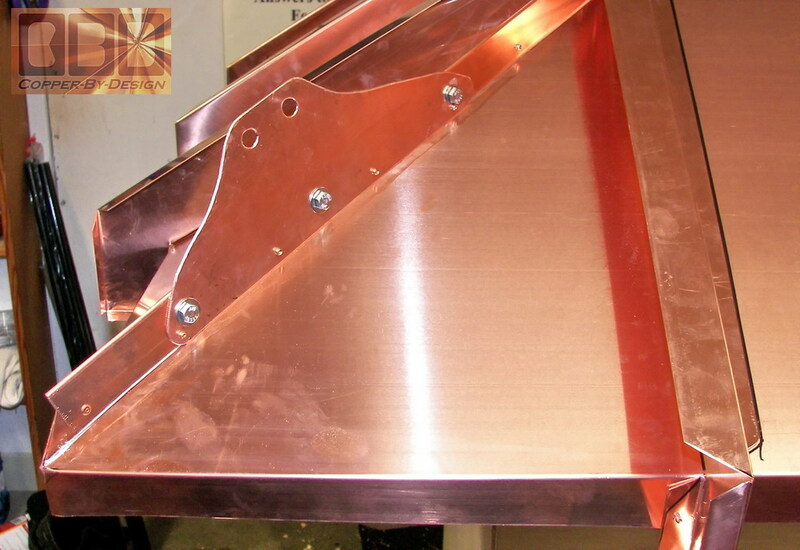 Each corner bracket has a set of 3 stainless steel bolts anchoring it to the hood liner. 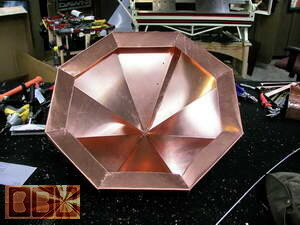 There is a 4" tall rim on the outer shell. 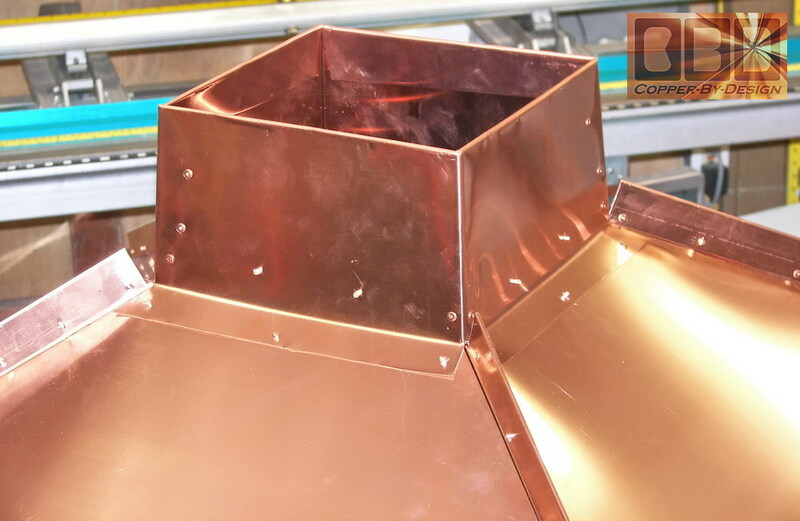 You can see here the white vinyl covered outer shell that is a thicker 24oz copper from a different supplier than we buy most of our copper from. 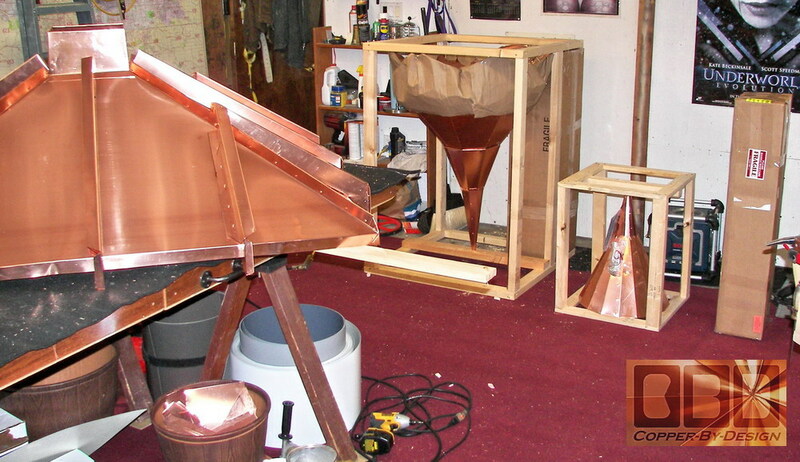 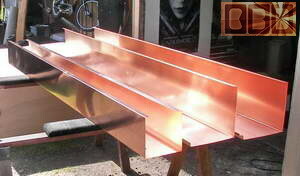 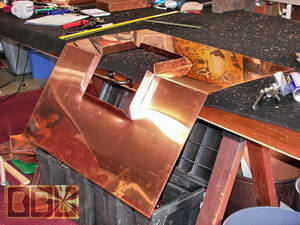 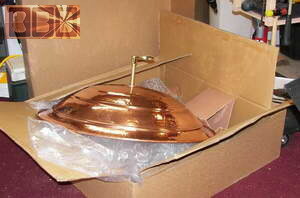 I had decided to use this thicker copper instead of the 20oz copper we had bid this to use. 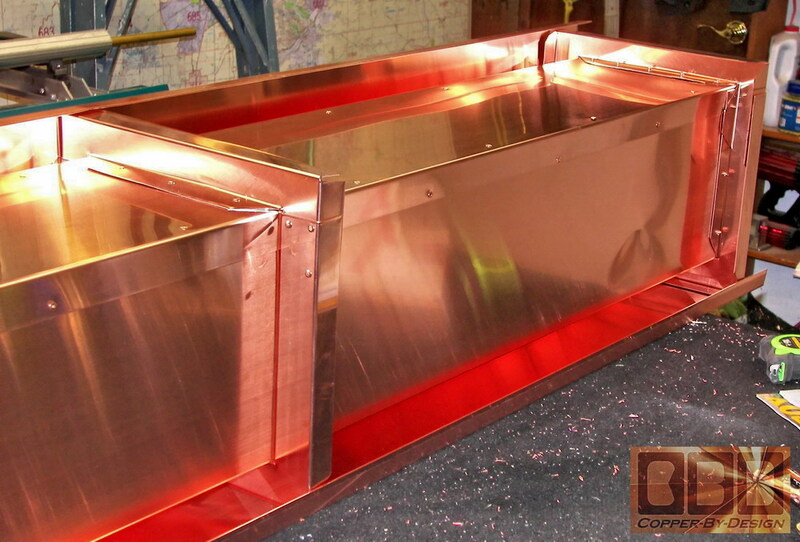 It cost us twice as much per square foot for this 4' wide copper sheet that is only 1/5 thicker, but we needed a wider sheets for this construction to be as seamless as possible, and felt with such wide flat sides on it this thicker copper sheet was an important detail. 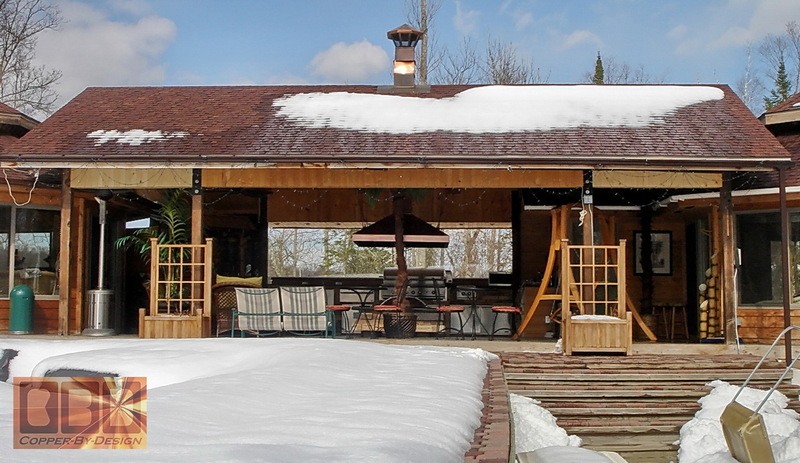 Even though it is not something we can charge the client extra for at this stage, it is not uncommon for us to come up with improvement like this as we build. 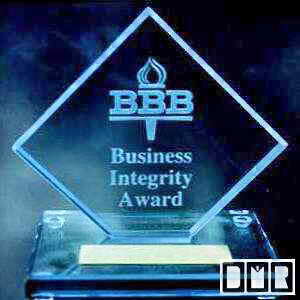 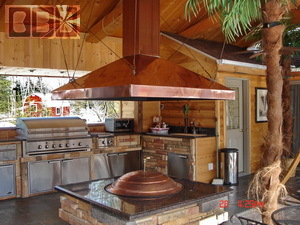 We would not hold back from implementing advantages we may not have considered during the quote process. 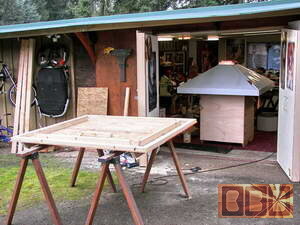 Once assembled it was structurally solid feeling and did not seem to have any flex to it. 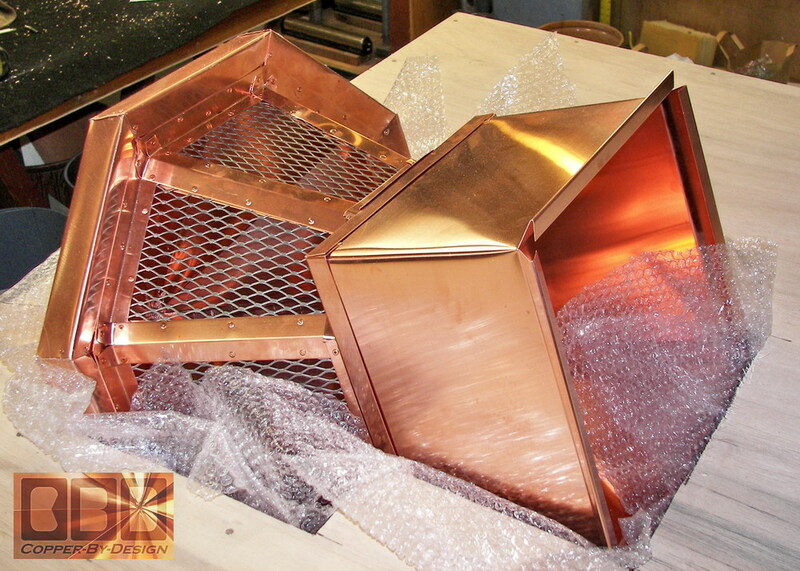 Here is the crate being built for it's safe journey across the country to Minnesota. 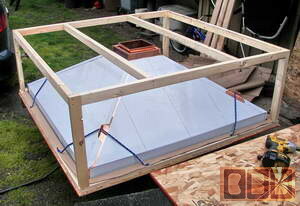 I have ropes tying it down to the crate base to make sure it does not move while in transit. 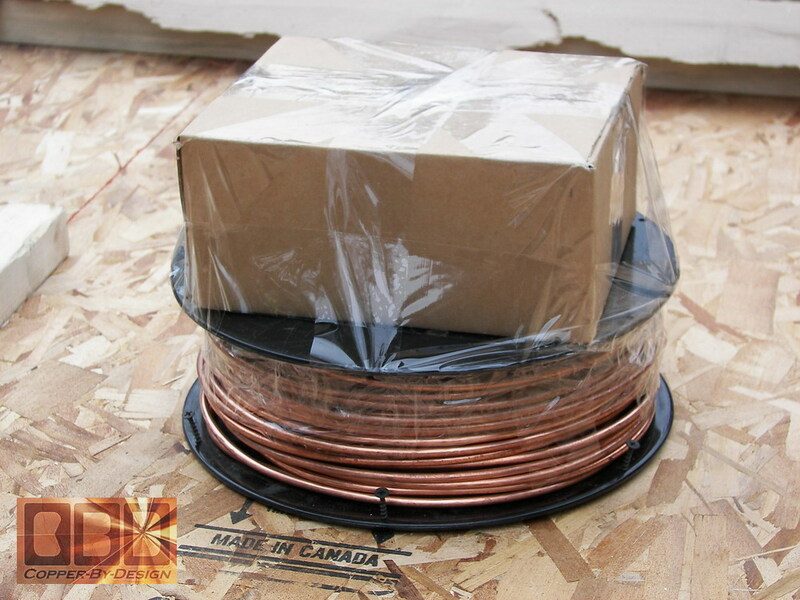 The spool here is the 100' of the 4 gauge copper wire for suspending the hood for installation along with other hardware in the box. 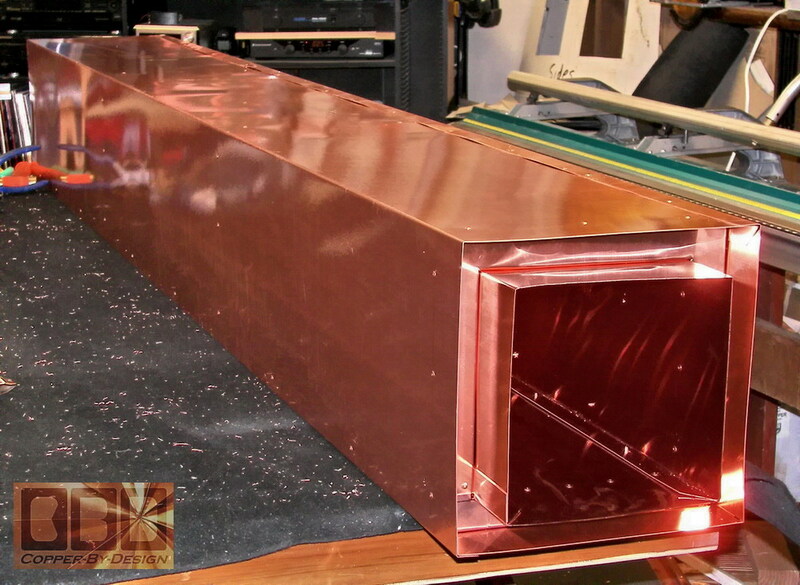 Here is the square 8' 10" tall double walled flue pipe he requested we make for the hood to deliver the exhaust safely out through the roof of the breeze way. The outside shell is 12" x 12". 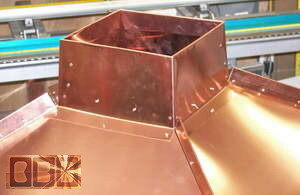 The inside of the flue is 9" x 9". 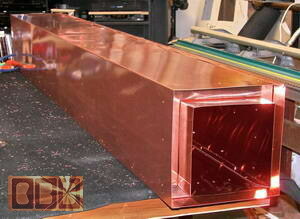 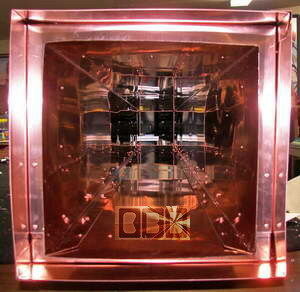 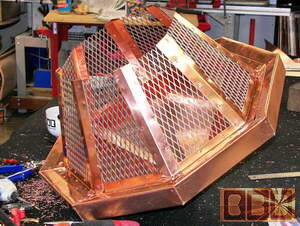 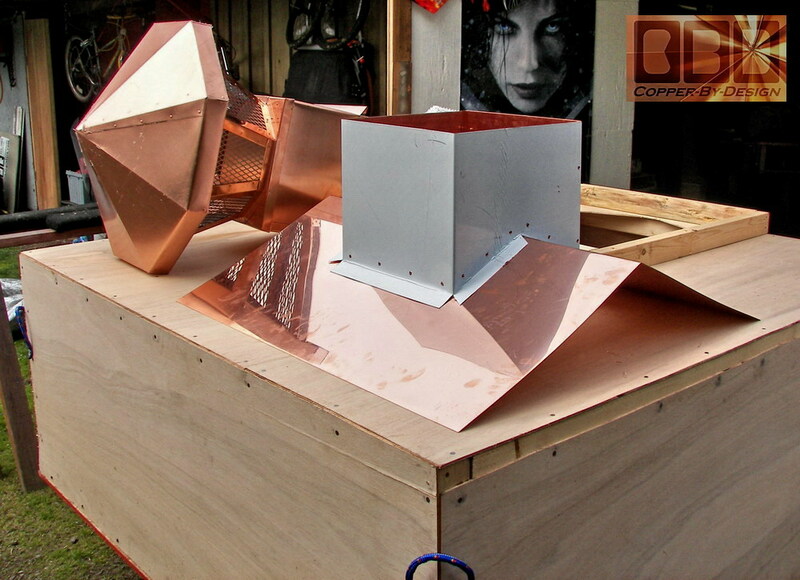 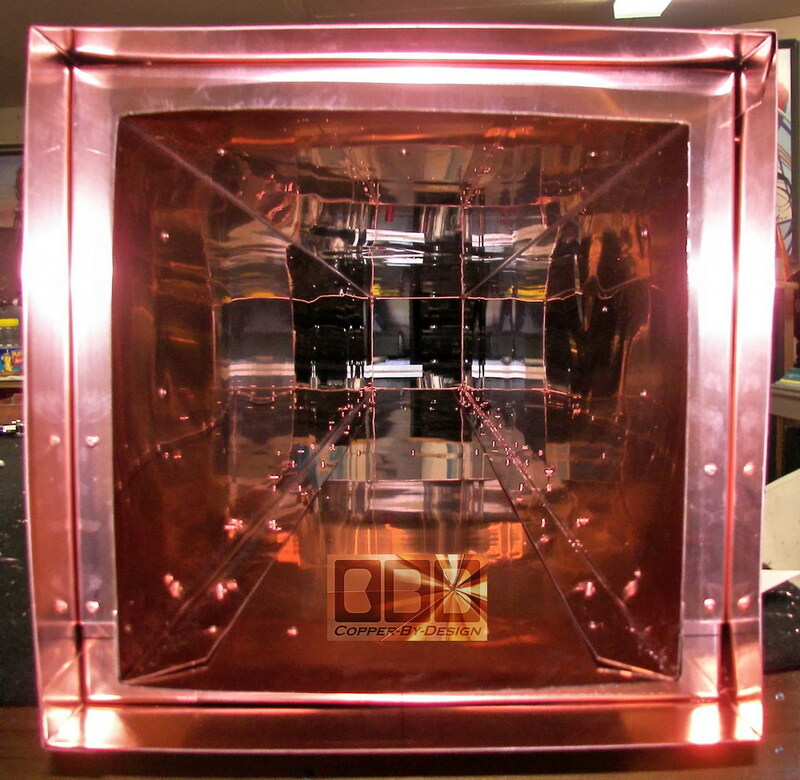 It weighs just over 100#, which translates to 80.4 square feet of the 20oz copper sheet metal we used. 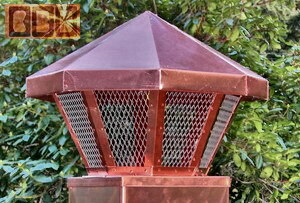 It took 3 full sheets that are 3'x 10' to make this one flue pipe. Here it is being crated up tight separately. 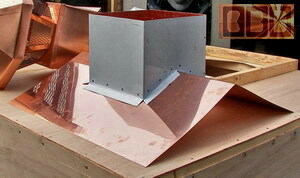 We also made this roof flange kit and small chimney cap shown below to go over that flue pipe. 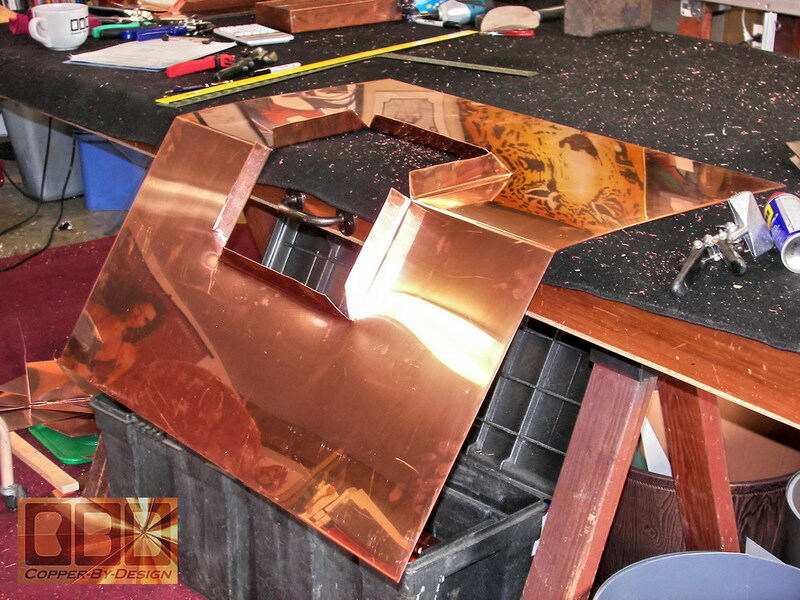 The flange base was made out of a 3' x 3' thicker sheet of 32oz copper and weighed 24# with the 24oz copper collar seen in white. 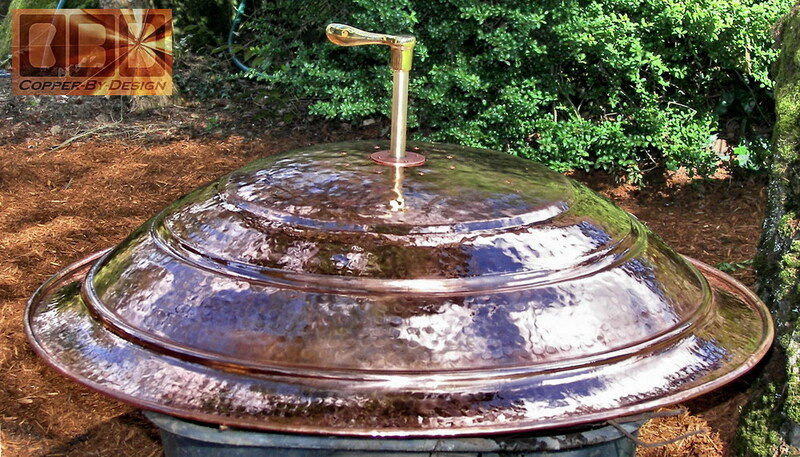 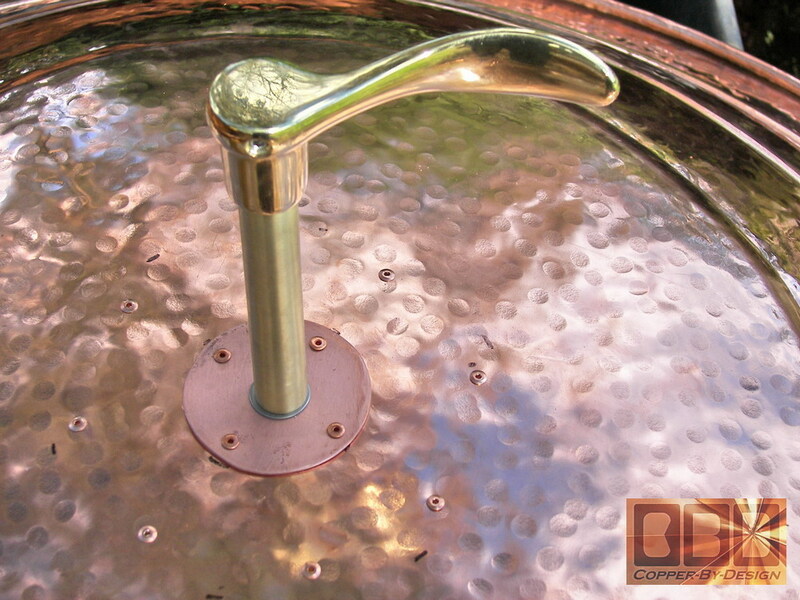 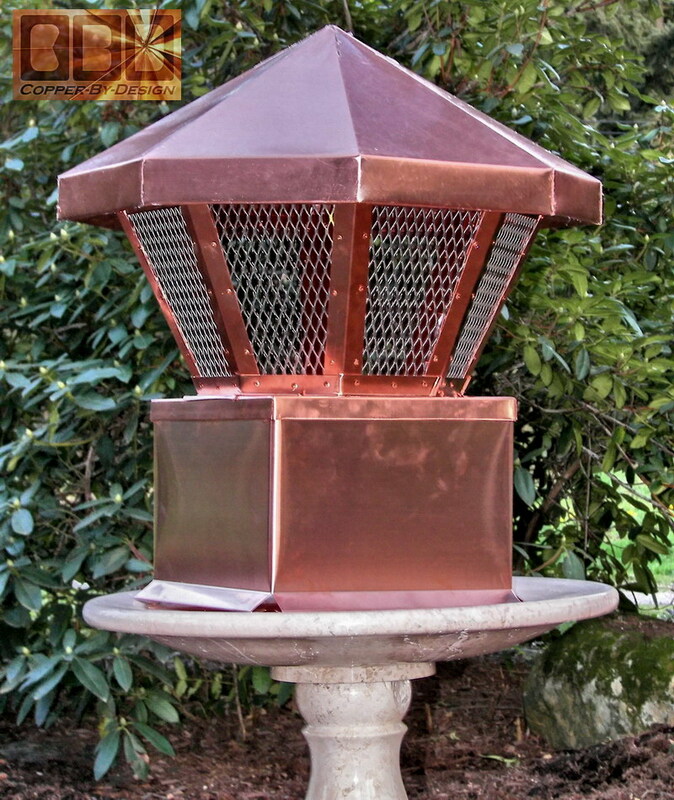 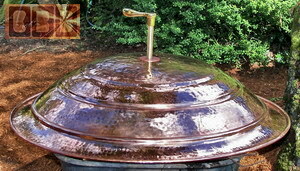 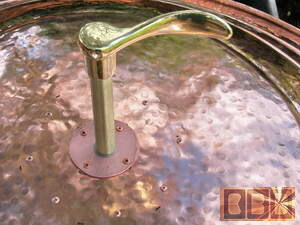 The 20oz copper chimney cap is 18" wide and has a 12.5" base. 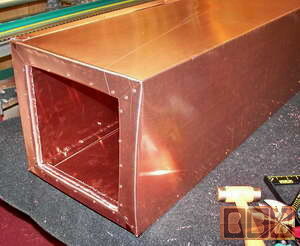 It has 16 gauge stainless steel spark arrest screen. 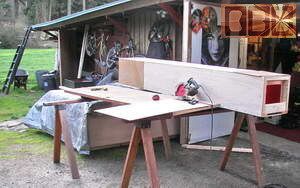 Total weight was 24# when completed. I feel I did a very good job making a more interesting chimney cap than he had expected. 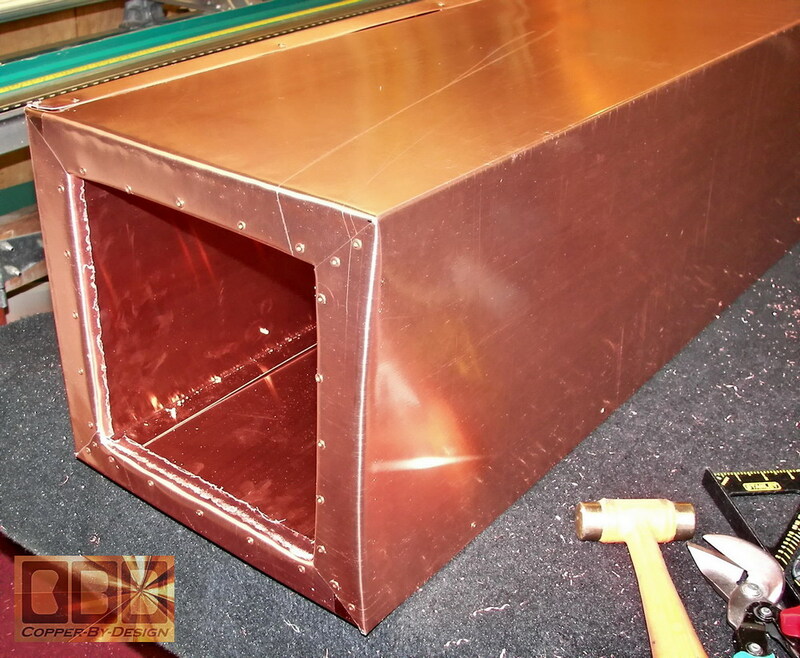 Here is the 37.5" wide fireplace cover lid we got for him and attached this brass handle. 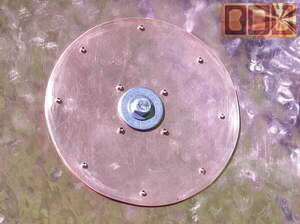 Inside the lid is a 6.5" wide disc of thick 48oz copper we made, and you can see the 2.75" wide disc on top of the lid just under the 3/4" solid brass rod. This is a close-up of a stainless steel eye with a 4 gauge copper wire over it. 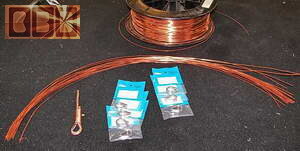 To just wrap 2" of that wire it took a full 3' of this 14 gauge copper wire. We sent 20 sets of the thinner wrap wire. 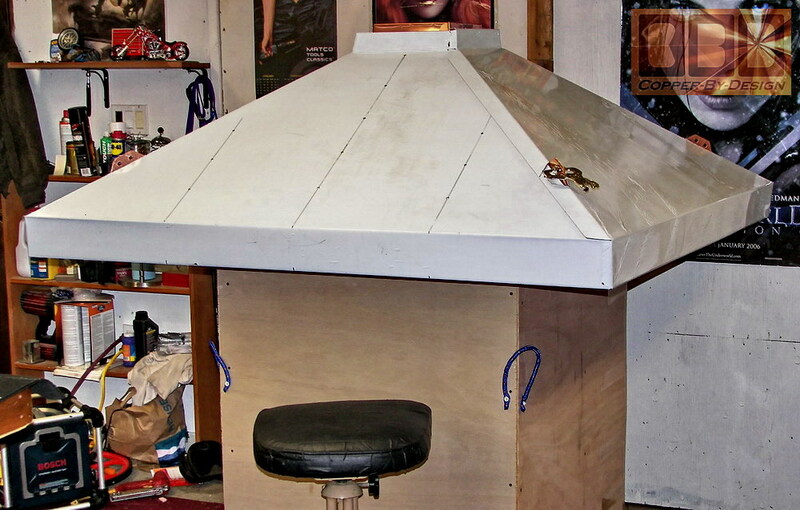 It is to support the hood under the roof beams. 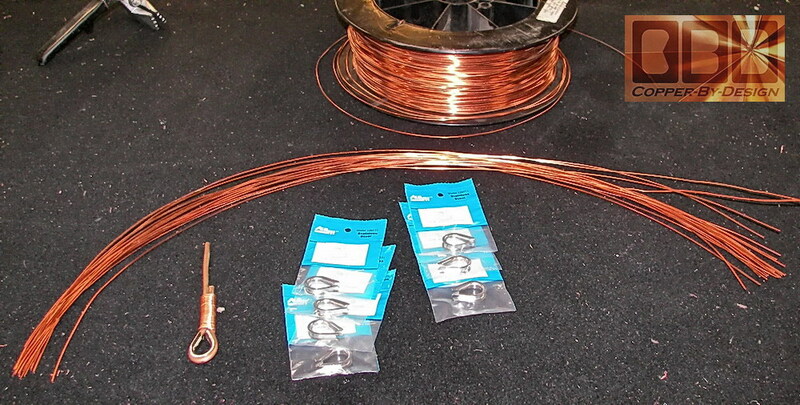 We also sent 12 stainless steel eye hooks to connect the copper support wire to. The client was able to use the wood shipping crate to set the hood on while setting up the support wires. 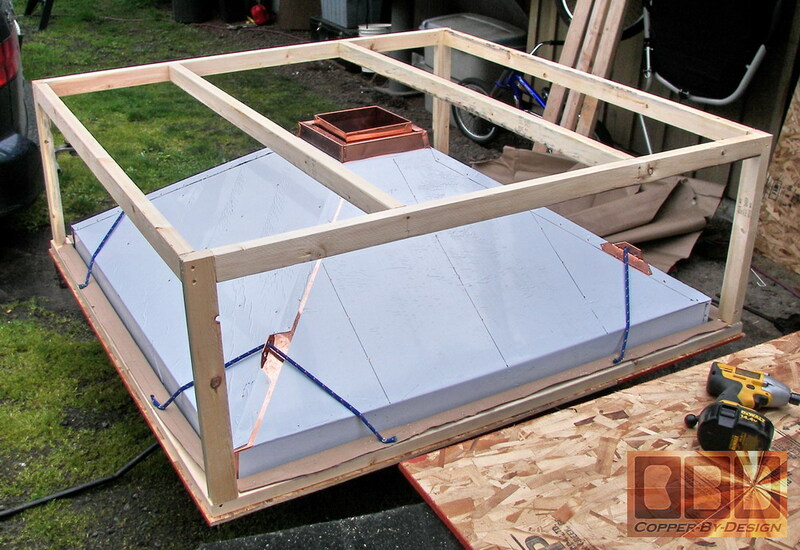 I recommended setting the hood a few inches higher than the desired height, since it would most likely drop a bit once the crate was moved out from under it, but he reported it had not dropped even an inch down. 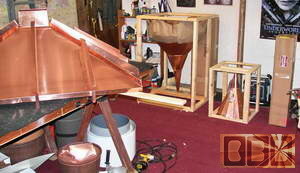 Here are a few photos I finally got from the client 2 years later (4/08). 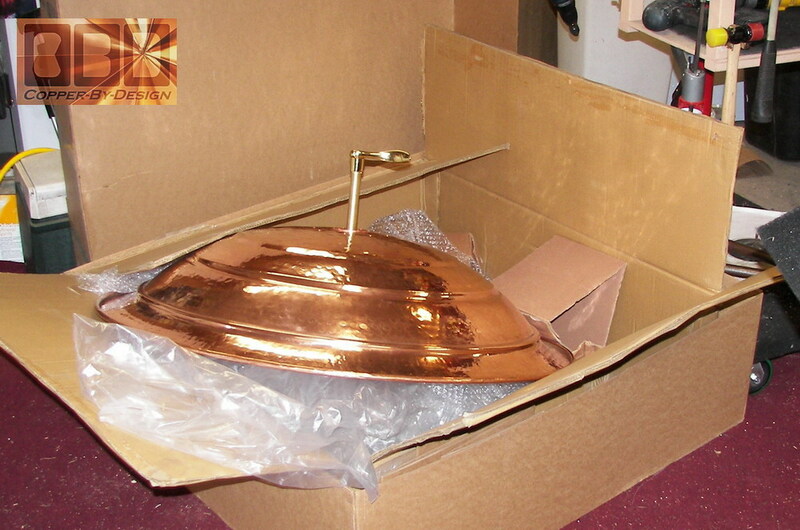 It still looks like new. I think he must have had it polished from time to time. 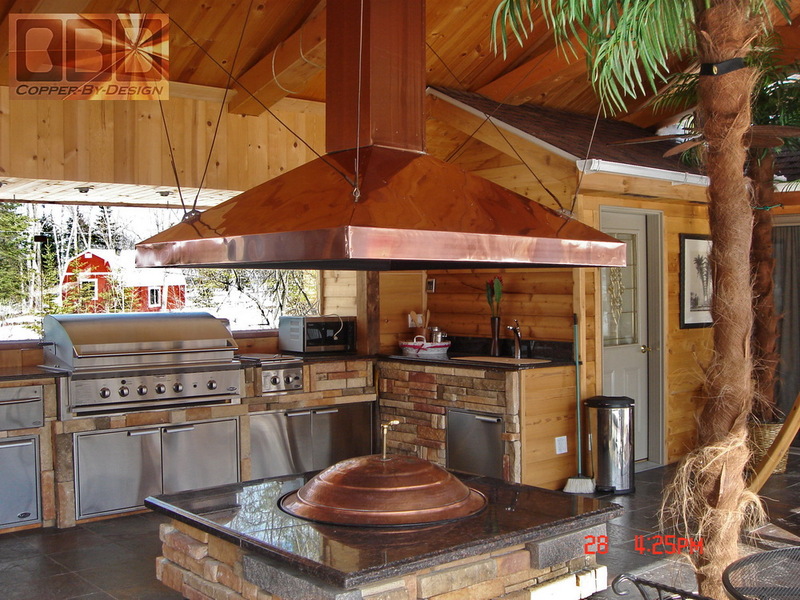 He reports that during the start period and when the fire dies down it is not hot enough to keep a good draw up the flue and a gentle breeze is able to push the smoke out the sides. The smoke seems to be able to cool off too much between the fire pit and the hood. He already tried lowering the hood a bit, but that did not solve this issue, so we are looking into getting a high temp electric fan to put in at the top just under the chimney cap to maintain a good suction and exhaust flow out the top. 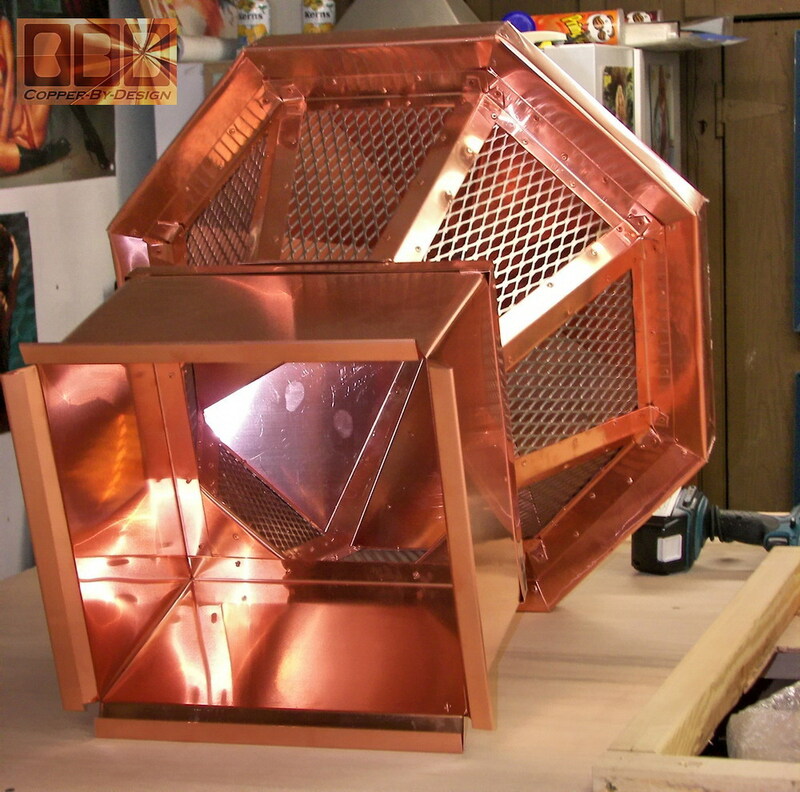 there seems to be only one company who makes these high temp fans for chimneys called Exhausto and they are $1,200 for their smallest unit. 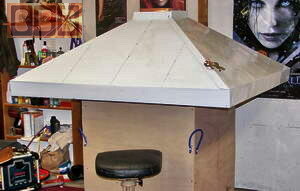 I will report how this works out as soon as I have something.